NEW ORLEANS – Just because another exciting weekend of action has come and gone doesn’t mean that heavy changes were set to happen in the latest edition of the NCAA Division I Men’s Outdoor Track & Field National Rating Index released on Monday by the U.S. Track & Field and Cross Country Coaches Association (USTFCCCA). The index stood firm as the top three teams in the nation and six out of the top-10 programs experienced no change from the previous ratings. In fact just 16 of the nation’s current top-25 had any type of movement, positive or negative, in this week’s release. This won’t be the case for future editions as this week in the final one in which the previous season marks will be used in the National TFRI (except for the 5000, 10000 and combined events) which means that big changes are on the way a week from now. For the fourth consecutive week Texas Tech is the No. 1 team in the land, a spot they have held so far this outdoor season. The Red Raiders didn’t add any new individual marks to their already impressive index rating after having an off-weekend from competition. The group will be back with the Michael Johnson Invitational at Baylor this weekend. It is the longest time spent in the top spot consecutively in program history. Holding in the No. 2 spot was Texas A&M, a spot the program has sat in for four straight weeks. The Aggies hosted their A&M Invitational this past weekend, a meet in which they captured the victory with 189 points. Texas A&M and Houston were separated by just four points with four events remaining before the Aggies were able to pull away. Remaining steady at No. 3 was Florida, the third straight week they have held the position. The Gators haven’t competed since the Raleigh and Florida Relays back on March 28-30. They will go again this weekend with a short trip to Baton Rouge for the LSU Alumni Gold meet. Moving up two spots to No. 4 was LSU after a successful weekend at the Miami Hurricane Alumni Invitational. Three new marks made the index with none bigger than the new No. 1 4×400 team in the nation after the Tigers posted a 3:02.88. JuVaughn Harrison also added the third-best long jump in the ratings to go with Jaron Flournoy who is now 22nd overall in the 100 as an individual. It is the best mark for the program since the final rankings of the 2016 season. Completing the rest of the top-five at No. 5 was BYU. The Cougars are fresh off competition at the Triton Invitational. They did not add any new marks to their index rating this week. The top-10 was rounded out by Alabama, Oregon, Florida State, Houston and Mississippi State, in the following order. Just because the top-25 didn’t have a lot of change overall doesn’t mean that a program didn’t make its mark this week as Ohio State jumped 19 spots to No. 22 after an impressive showing at the Gamecock Invitational. The largest improvement overall was taken by No. 108 Grand Canyon after a 37-spot increase. Other big gains were seen from No. 51 Northwestern State (up 21 spots) and No. 41 South Carolina State. Three previously unranked programs joined the ratings this week in No. 96 Rhode Island, No. 144 Villanova and No. 172 Alabama State. 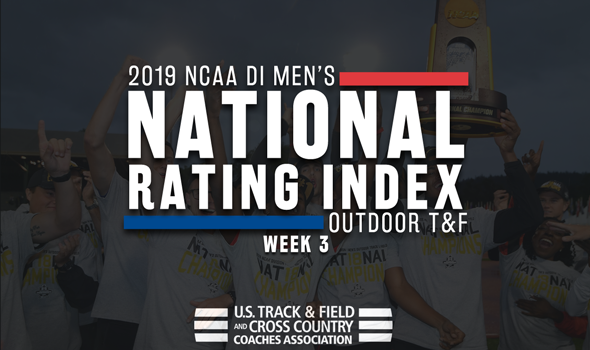 The next NCAA DI Men’s National Track & Field Rating Index will be released on Monday, April 22.